Celebrate a devilishly delicious Halloween with these Halloween Skeleton Cupcakes from cupcakerecipes.com (click on title to go to site). 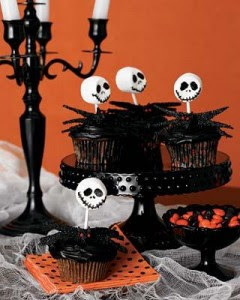 Decoration: black gel or paste food color, 24 marshmallows, 24 (4-in.) thin breadsticks (grissini) or lollipop sticks, a clean artist’s brush, 24 grape fruit leather snacks (like FruitaBu), black decorating sugar, red nonpareil candies. Heat oven to 350°F. You’ll need 24 regular-size muffin cups lined with paper, foil or Halloween-themed liners. Beat cake mix, buttermilk, eggs and oil in large bowl with mixer on medium speed 2 minutes or until just blended. Divide batter between muffin cups (1/4 cup batter per cup). Bake 24 minutes, or until a wooden pick inserted in centers comes out clean. Cool in pan on wire rack 15 minutes before removing cupcakes to rack to cool completely. Tint chocolate frosting black with food color; frost cupcakes. To decorate: Slightly flatten marshmallows with palm of your hand. Insert a broken length of breadstick or lollipop stick into each marshmallow. Place some black frosting in a microwave-safe custard cup and microwave about 5 seconds, until thin and runny. Paint skeleton faces onto marshmallows with a fine paintbrush. Using the photo as a guide, cut fruit leather into bat wings with scissors; press in decorating sugar to coat. Roll fruit leather scraps into small balls, then shape into bat heads with ears; coat heads in sugar. Attach 2 nonpareil candies for eyes with a dab of frosting. To assemble: Using photo as guide, stand bat wings upright in frosting on top of cupcakes. Insert a skeleton head behind wings into middle of cupcake. Attach a bat head in middle of wings with frosting.Plan Ahead: You can bake cupcakes 2 weeks ahead and freeze. Frost and decorate up to 1 day ahead, cover and keep at room temperature. In a small bowl, mix vinegar and baking soda. Yes, it will fizz! Add vinegar mixture to the cake batter and stir well to combine. Using an ice cream scoop, fill cupcake cups with cake batter (they should be 2/3 – 3/4 full). You may not fill all the cups, I ended up with 20 cupcakes. Place muffin tins on the middle rack of a preheated 350 degree oven. Bake for approximately 20-22 minutes, rotating pans halfway through. Cupcakes are done when a toothpick inserted in the center comes out clean. Check early and don’t overbake! 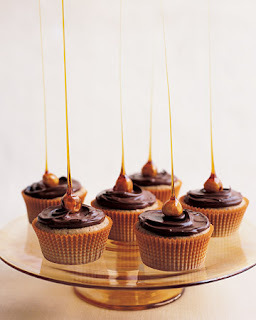 Cool the cupcakes in their tins on a wire rack for 10 minutes then remove and allow to cool completely before frosting. 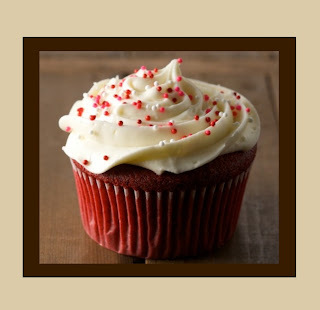 Frost cupcakes with cream cheese icing (recipe below) and decorate with red sprinkles if desired. The cupcakes above were decorated using the Wilton Cupcake Decorating Kit and Valentine’s Sprinkles. They can usually be found at craft stores like Michaels or Joann. Enjoy the cupcakes with those you love! Recipe Notes: *Sift cake flour once before measuring, then sift again with the other dry ingredients per recipe instructions. Wear an apron and be careful with the red food coloring–no matter how hard I try, I always end up staining something! As you’re mixing the cake batter, use a spatula to scrape down the bowl frequently throughout the entire process. Since the batter is fairly thick, I have found that an old-fashioned ice cream scoop works best for filling the cupcake wells (also great for muffin batter!). Since all ovens are different, make sure you check the cupcakes a little early. Mine were ready in just over 20 minutes, yours may be done sooner, or they may take a minute or two longer. With an electric mixer, blend together cream cheese and butter until smooth. Turn mixer to low speed and blend in powdered sugar, salt and vanilla extract. Turn mixer on high and beat until light and fluffy. Use immediately or refrigerate, covered, until ready to use. If refrigerated, the frosting will need to be brought to room temperature before using (after frosting softens up, beat with mixer until smooth). Recipe Notes: If you prefer a sweeter and/or stiffer frosting, more powdered sugar can be added (up to four cups). But remember, the more sugar you add, the less you’ll be able to taste the tangy cream cheese! Not a Recipe but GORGEOUS!!! Kitchen Kraft has great looking wrappers for your cupcakes. For more on Martha Stewart's recipes, visit her at marthastewart.com. I like those wrappers! 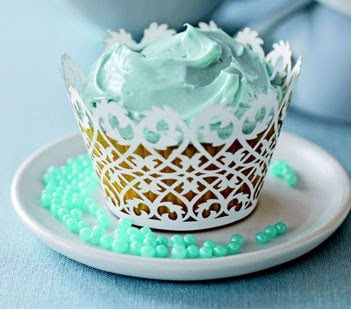 Easy way to make cupcakes look fancy!